restrictive environment. And even with a more restrictive environment, the law requires that there be a continuum of placement options from least restrictive to most restrictive. Okay. lot of procedural safeguards involved in educating students with disabilities. But you need to understand that everything that Pennsylvania asks us to do is founded in federal law. at all of our students. In terms of referral, sometimes the screening that we do, those kinds of screenings that I just talked about, lead us to believe it's kind of like having the fever. be eligible becomes really important under disciplinary kinds of situations. Okay, I'm going to hand it over to Cecil. But before I do that, are there any questions that you might have? we're going to pick up with starting with the evaluation process. And do Diane kind of walked us through the schools' responsibilities with regard to Child Find and with referral activities. education services. 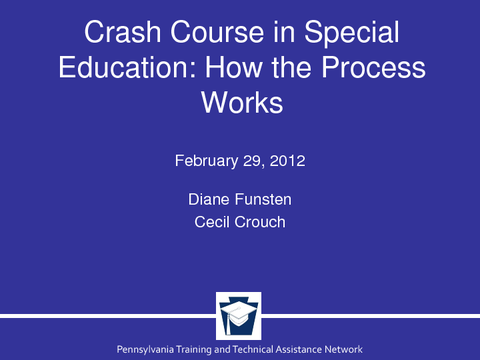 What makes a child eligible for special education is meeting these two prongs. We call it a two-pronged determination process. So one, does the child have a disability? their friends, time to talk with advocates, just to figure out what they think they would like their appropriate next course of action to be. So the minimum is that 10 school days. are given the document to sign by an administrator and it has your name on it that you were there, but you were not there? CECIL CROUCH: You wouldn't want to sign it if you weren't there. remember, we're starting with where the student is right now, their present levels. And then we're saying our measurable annual goals are where the student is going to be a year from now. does the student need. What about instructing this student is different from what we do for everybody else? Or what do we do for everybody else, but is absolutely critical for this child? and gives the code, we'll answer some questions.